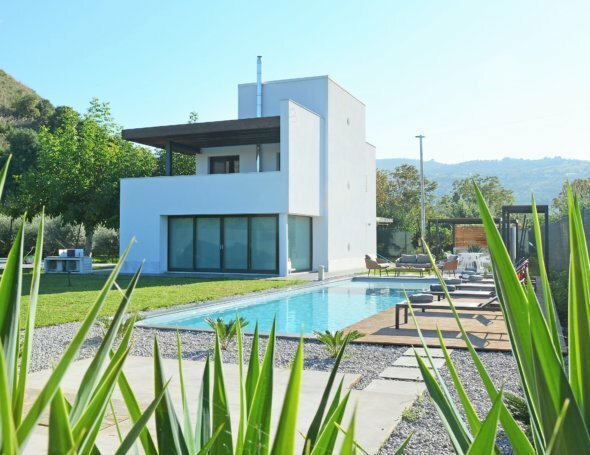 Villa Rosa with a breathtaking view of Cefalu. Villa Rosa is a large Villa in Cefalu surrounded by private grounds and mature trees in a beautiful hillside setting overlooking the sea. With terracotta tiled floors, wooden beamed ceilings and exposed stone walls, the villa has a classic country style. Solid wood furniture, wrought iron beds and traditional Sicilian tiles add to the villa’s rustic appeal. Comfortably sleeping up to ten, Villa Rosa works well for a large family group with children or groups of friends visiting Cefalu. Relax in one of two living rooms or outside you can explore the gardens or lounge by the pool and admire the views. Although there is a large dining room, during the summer months, all meals are enjoyed outside on the dining terrace after a dip in the pool. Towering palms and other trees provide welcome shade in the heat of the day. Ground floor: Kitchen with dining area, two living rooms, twin bedroom with bathroom with shower, steps to the first floor with twin bedroom and shower room, separate entrance to the small sitting area, shower room, steps to first floor double bedroom. First floor: stairs from the living area: two double bedrooms with two en-suite bathrooms with showers. We’ve had an amazing two weeks on Cefalu. The peace and tranquility of Villa Rosa and grounds has made us feel very relaxed. Stunning setting with amazing views and we spent lazy days around the pool, lunching under the pergola and BBQing in the evenings.Lovely house, comfy beds, great facilities, with a great wifi connection! Giorgia was extremely helpful and has an extensive knowledge of the town. She has has a fab sense of humor and nothing was too much trouble. She gave us some great tips and advice. Villa Rosa has been lovely place to stay. The views are magical and the pool is one of the nicest we have had. Sicily is beautiful, so many trees and very friendly people! We hope we will come back! The villa Rosa is everything we wanted/expected. We are veterans of Villa holidays – this one was outstanding from every angle. Thank you Massimo. And a very big thank you to our Massimo Villas representative! We just stayed there last week (May 28) and the weather was perfect, the ocean temperature was eminently swimable (around 75 degrees F.). 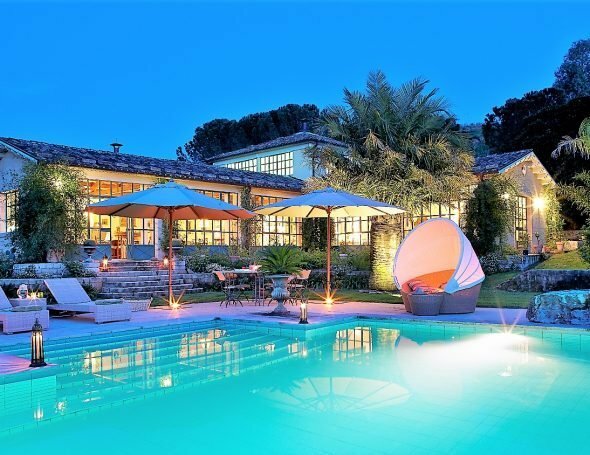 The setting is magnificent other than some power lines that go directly over the pool. You get used to them quite quickly. The views from the outside eating area and pool along with the pool’s setting make this a place you really want to consider. The kitchen is very well outfitted. The family rooms are more than you need. In the heat of the summer you will probably run an extra 50 euro per day bill for electricity if you air condition at night to sleep. For the most part we kept the windows open and the only negative to the place was the cheap window screens that let in a modest amount of mosquitoes resulting in a couple stings every night. Recommend the Sant Ambrogio restaurant Osteria something. Great views as well. Their pasta was great and everything else was very good except the thinly sliced sword fish was overcooked.